The Department of Economics focuses on research and teaching excellence. Our research encompasses a broad range of topics and faculty members have published in the very best journals in Economics. Our graduate and undergraduate programs cover exciting real-world developments and equip students with contemporary analytic skills. Excellent co-op work opportunities combined with classroom learning are key to our students' outstanding record of success. The Department of Economics acknowledges that we are living and working on the traditional territory of the Attawandaron (also known as Neutral), Anishinaabeg and Haudenosaunee peoples. The University of Waterloo is situated on the Haldimand Tract, the land promised to the Six Nations that includes six miles on each side of the Grand River. Read More. Professor Anindya Sen had an article published in the National Post about how The Arts is filling gaps in data science. Professor Sen discusses how the social sciences and humanities not only provide perspective in behavioural theories and trends but also aids in spearheading ethics and governance in the data science world. 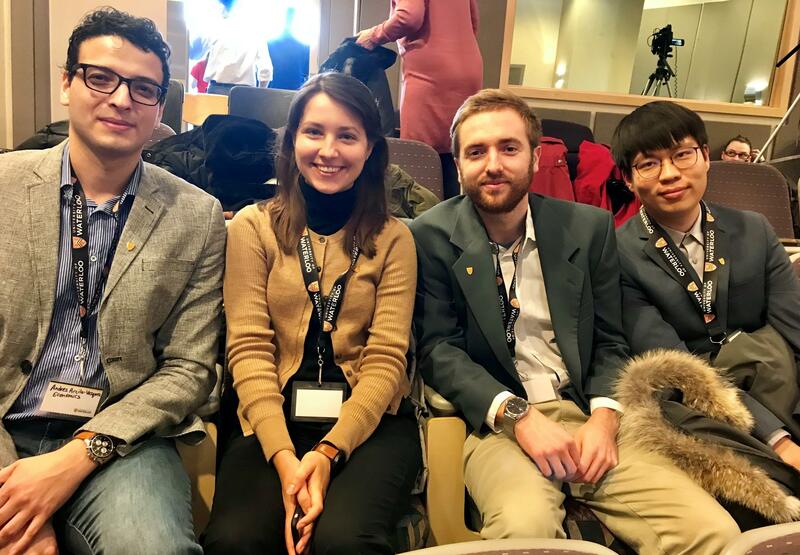 Congratulations to our PhD student team of Andres Arcila Vasquez, Iuliia Nesterova, John Baker, and Zehua Pan (pictured below), who received third place in the inaugaral Datafest organized by Professor Anindya Sen, Director of the Master of Public Service program on Friday, March 4, 2019. Economics had two MA teams as well - Team 1 - Hongcan Zhang, Keyi Zhang, Sophie Yin, Haochang Li, and Team 2 - Siwei Shen, Wenzuo Xu, Tong Zhou, Yongyun Zhou. Congratulations to our Economics team who participated in the Bank of Canada’s Governor’s Challenge. In November 2018, the team presented their recommendations for Canadian monetary policy to a panel of judges. Coached by Professor Jean Paul Lam, the team did a great job of summarizing current key issues in monetary policy. We are proud of our team! Team members from left to right are Austin Coles, Alexander Colenutt, Tijil Dewan, Kamilah Ebrahim, Sin Yeung, and Isil Dogan.